My favorite permutation of the Yellow name in the Chicago area is Wolley, sporting an all orange automobile. 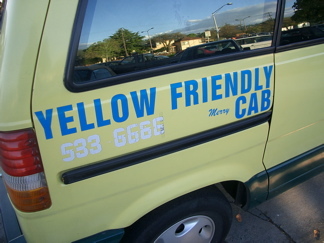 Though I beleive this to be directly linked to the parent Yellow Cab Company. The “merry” designation begs the question: Do they drive Oldsmobiles? Does *anybody* drive Oldsmobiles anymore?